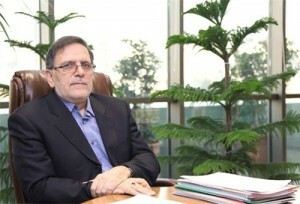 TEHRAN (Tasnim) – Head of the Central Bank of Iran (CBI) Valiollah Seif announced that seven foreign banks have been specified so far to conduct financial transactions with Iran following the Geneva nuclear deal, noting that three Japanese ones will embark on the task as early as Monday. “Following the Geneva (nuclear) deal, seven banks have been specified for the financial transactions, one of which, in Switzerland, has already started its operational activity, while three Japanese banks will also embark on the job (transactions) from the coming Monday,” Seif said on the sidelines of a gathering of pharmaceutical industry owners in Tehran on Saturday. He also noted that the CBI is trying to woo banks from the regional countries, including the United Arab Emirates (UAE). Earlier on March 5, the CBI had announced that the tree Japanese banks, namely Bank of Tokyo-Mitsubishi (BTMU), Sumitomo Mitsui Banking Corporation (SMBC) and Mizuho Bank have expressed preparedness to conduct financial transactions with Tehran. On March 5, Reuters quoted diplomatic sources as saying that Japan has made a second payment to Iran for oil imports following the partial easing of sanctions on Tehran in line with the Geneva nuclear deal. On November 24, 2013, Iran and the Group 5+1 (the five permanent UN Security Council members plus Germany) signed a six-month deal on Tehran’s nuclear program in Geneva after several rounds of tight negotiations. Based on the interim deal (the Joint Plan of Action), the world powers agreed to suspend some non-essential sanctions and to impose no new nuclear-related bans in return for Tehran’s decision to suspend its 20% enrichment for a period of six months. The breakthrough deal, which has come into effect since January 20, stipulates that over the course of six months, Iran and the six countries will draw up a comprehensive nuclear deal which will lead to a lifting of the whole sanctions on Iran. Japan last month became the first of Iran’s oil buyers to make a payment for crude imports under the deal, sources told Reuters, with one source confirming the amount of $550 million. According to the agreement, the second and third payment schedules were March 1 for $450 million and March 7 for $550 million.